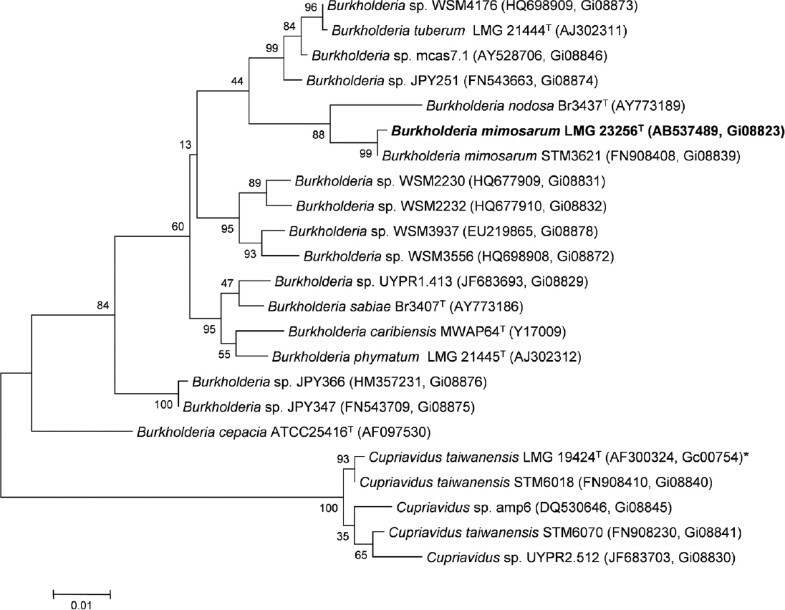 In addition to the different groups of rhizobia from the Alphaproteobacteria, a number of Betaproteobacteria belonging to Burkholderia and Cupriavidus are now also known to be present in legume nodules; they are sometimes referred to as betarhizobia [3–5]. Several Burkholderia species have been described from root nodules of different Mimosa species: B. caribensis from M. pudica and M. diplotricha [4,6], B. mimosarum from M. pigra and M. scabrella , B. nodosa from M. bimucronata and M. scabrella , B. phymatum from M. invisa and Machaerium lunatum [6,9] and B. sabiae from M. caesalpiniifolia . Moreover, several Burkholderia strains have been shown to enter into effective symbiosis with their host . 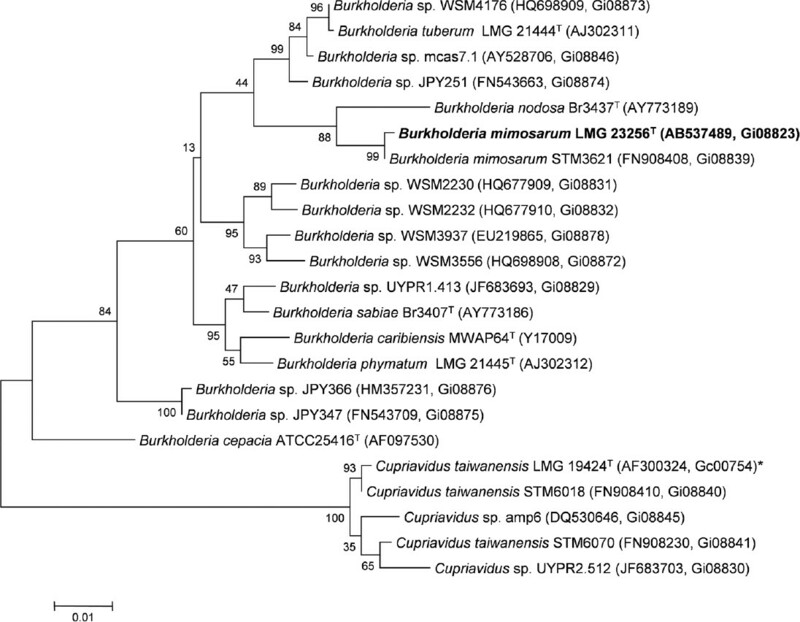 B. mimosarum strain LMG 23256T is a non-sporulating, non-encapsulated, Gram-negative rod within the order Burkholderiales of the class Betaproteobacteria. The rod-shaped form varies in size; it is approximately 1.0 µm in width and 2.0 µm in length (Figure 1, Left and Figure 1, Center). It is fast-growing, forming colonies within 3–4 days when grown on half strength Lupin Agar (½LA) , tryptone-yeast extract agar (TY)  or a modified yeast-mannitol agar (YMA)  at 28°C. Colonies on ½LA are white-opaque, slightly domed and moderately mucoid with smooth margins (Figure 1, Right). Minimum Information about the Genome Sequence (MIGS) is provided in Table 1. Figure 2 shows the phylogenetic neighborhood of B. mimosarum strain LMG 23256T in a 16S rRNA sequence based tree. This strain shares 99% (1,121/1,124 bp) and 98% (1,101/1,125 bp) sequence identity to the 16S rRNA of the fully sequenced strain B. mimosarum STM3621 (Gi08839) and to B. nodosa Br3461T, respectively. Allpaths-LG (PrepareAllpathsInputs:PHRED64=1 PLOIDY=1 FRAGCOVERAGE=125 JUMPCOVERAGE=25 LONGJUMPCOV=50, RunAllpath-sLG: THREADS=8 RUN=stdshredpairs TARGETS=standard VAPIWARNONLY=True OVERWRITE=True).